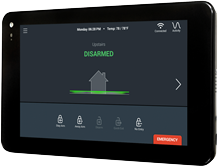 MILWAUKEE – (May 2, 2018) – Johnson Controls introduces the New iotega wireless Touchscreen, an easy to install Wi-Fi enabled solution that gives customers the freedom to manage and monitor their smart security and home automation platform from a full seven-inch touchscreen display. Designed for residential and small business properties, the iotega wireless Touchscreen is part of the iotega line of safety, security and lifestyles solutions. With state of the art encryption, the iotega wireless Touchscreen securely connects to the iotega panel wirelessly. Installers can wall mount the Touchscreen virtually anywhere or, using an optional table stand, locate it on a bedside table or an office desk. Users can securely control their encrypted security system, automation system, lights and locks, and also view video cameras with a simple touch of a finger on the iotega wireless Touchscreen display. The seven-inch wireless Touchscreen features a high resolution capacitive display with 1024 x 600, offering one of the clearest screens available on the market. Its wireless connection enables greater ease of placement, providing a scalable solution with the ability to install up to four Touchscreens with the iotega platform. The iotega wireless Touchscreen is capable of receiving remote software updates, saving installers from labor-intensive customer visits and providing a virtually future proof system where new features and periodic updates can continue to enhance the end user experience. For more information about the iotega wireless Touchscreen, visit www.dsc.com.